Reverend Yvonne Hobson is under "enormous strain"
A Cornish parish priest is stepping down from her church role after a second arson attack. A lighted candle was pushed through the window of Rev Yvonne Hobson's car but failed to set the vehicle on fire. Now the Anglican priest is to take a two-week break from her duties after a request by the Bishop of Truro. Since July, Ms Hobson, 56, the curate at Paul Church, near Newlyn, has received a series of hate letters and suffered an arson attack on her home. The letters sent to her expressed a hatred of women priests. In October church leaders called for a halt to the attacks, but four weeks later a candle placed in the porch of her home ignited some logs and the fire brigade was called. 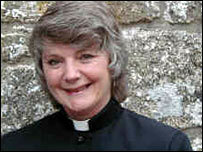 Bishop of Truro, the Right Reverend Bill Ind, has now asked her to take a temporary leave of absence. His spokesman Jeremy Dowling said: "It's very worrying and has put Ms Hobson and her family under enormous strain so he suggested that she have no more duties for a couple of weeks." He added: "She is bearing up well, but after this it makes you wonder where the next incident is going to come from." Ms Hobson said in a statement she was "very grateful for support from the parish and the local community". Devon and Cornwall Police said they were treating the latest incident as arson and have appealed for witnesses for anyone with any information to come forward. There are 19 full-time women priests in Cornwall and 92 men. There are also 22 women working as unpaid members of the clergy.